German Talmudist; died at Friedberg on the Shabu'ot festival, 1588. He was the eldest of the four sons of Bezaleel ben Ḥayyim, and spent his youth at Posen, the native city of the family. (comp. "Monatsschrift," xiii. 371). He and Moses Isserles studied with Shalom Shakna, whose methods of teaching Ḥayyim largely adopted. He began his literary activity at Worms, where he had gone in 1549; and, apparently, he succeeded his uncle Jacob ben Ḥayyim as rabbi in that city, after Jacob's death in 1563 (comp. 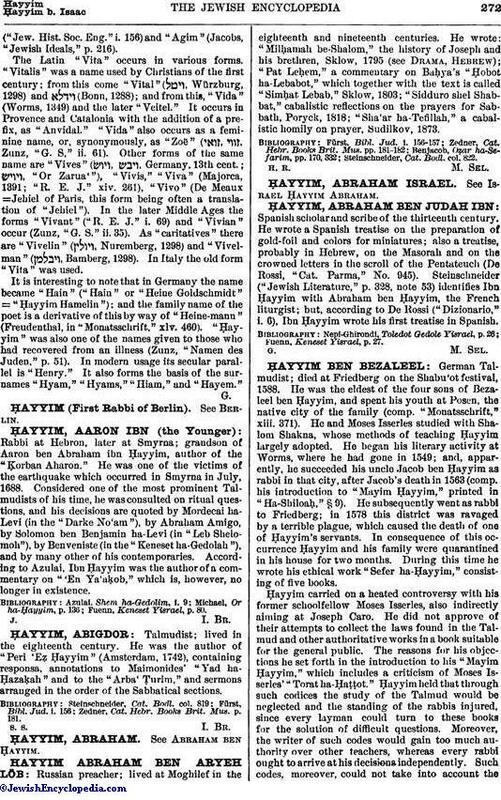 his introduction to "Mayim Ḥayyim," printed in "Ha-Shiloaḥ," § 9). He subsequently went as rabbi to Friedberg; in 1578 this district was ravaged by a terrible plague, which caused the death of one of Ḥayyim's servants. In consequence of this occurrence Ḥayyim and his family were quarantined in his house for two months. During this time he wrote his ethical work "Sefer ha-Ḥayyim," consisting of five books. Ḥayyim carried on a heated controversy with his former schoolfellow Moses Isserles, also indirectly aiming at Joseph Caro. He did not approve of their attempts to collect the laws found in the Talmud and other authoritative works in a book suitable for the general public. The reasons for his objections he set forth in the introduction to his "Mayim Ḥayyim," which includes a criticism of Moses Isserles' "Torat ha-Ḥaṭṭot." Ḥayyim held that through such codices the study of the Talmud would be neglected and the standing of the rabbis injured, since every layman could turn to these books for the solution of difficult questions. Moreover, the writer of such codes would gain too much authority over other teachers, whereas every rabbi ought to arrive at his decisions independently. Such codes, moreover, could not take into account theminhagim of all countries; and this, again, would lead to constraint in matters of conscience, since every one would have to observe the minhagim obtaining in the place where the author of the code in question was living. 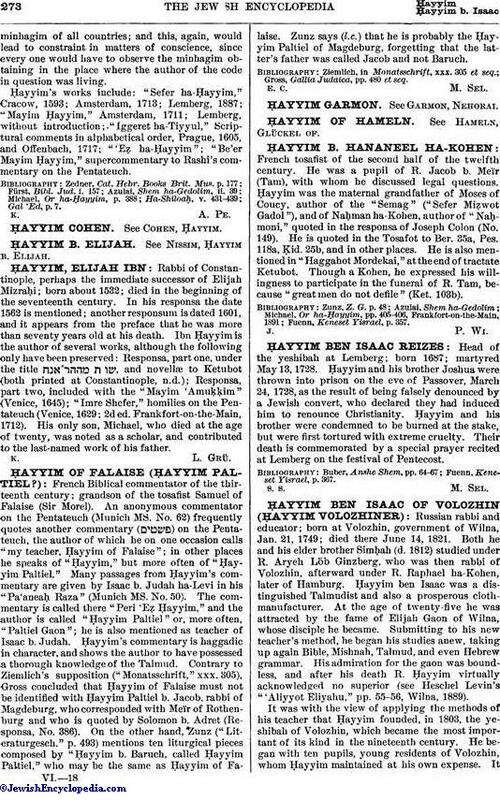 Ḥayyim's works include: "Sefer ha-Ḥayyim," Cracow, 1593; Amsterdam, 1713; Lemberg, 1887; "Mayim Ḥayyim," Amsterdam, 1711; Lemberg, without introduction; "Iggeret ha-Tiyyul," Scriptural comments in alphabetical order, Prague, 1605, and Offenbach, 1717; "'Eẓ ha-Ḥayyim"; "Be'er Mayim Ḥayyim," supercommentary to Rashi's commentary on the Pentateuch.